The rapidconnect 124F Rack Mount Fixed Tray is the cost effective and affordable option, with careful design providing optimized space for the cables bend radius also including an inner splice cassette to reduce the amount of space necessary to store cables safely and can hold up to 48 fibres at any one time. The rapidconnect Rack Mount Fixed Tray promotes efficient and organised cable management. This allows for fast set up and easy changes. A record book to keep track of all cables is also provided. 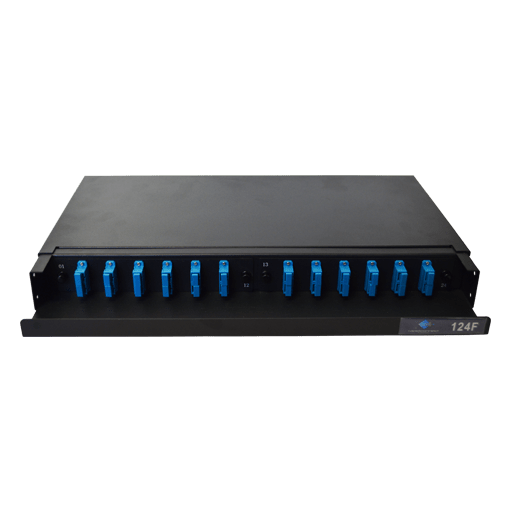 The rapidconnect Rack Mount Fixed Trays come with a variety of connector face plates; ST, FC, FCA, SC Simplex, SC Duplex, SCA Duplex, LC Duplex LCA Duplex LC Quad and LCA Quad. The rapidconnect Rack Mount Fixed Trays can hold up to 48 fibres at any one time. It comes with cable glands, heat shrink, screws and a record book for the most effective fibre management system. The rapidconnect 124F Rack Mount Fixed Tray is the cost effective and affordable option, with careful design providing optimized space for the cables bend radius also including an inner splice cassette to reduce the amount of space necessary to store cables safely. With a variety of face plates to suit any sort of connector the rapidconnect 124F Rack Mount Fixed Tray will suit what ever your needs. The rapidconnect Rack Mount Fixed Trays can hold up to 48 fibres at any one time. Download the technical specification bellow or contact us today to find out more.